With its vast stretches of golden coastline, vibrant cities and some of the most celebrated cuisine in the world, sun-kissed Spain offers endless riches just waiting to be discovered. Whether you want to lounge in the sun, explore world-class art galleries or seek out unspoiled villages, you can do it all with car rental in Spain. We have dozens of pick-up locations across the country, including in Barcelona and Madrid, along with coastal locations such as Malaga. Browse our vehicle collections to find the right one for your Spanish adventure - from spacious family cars to luxury models that are perfect for travelling in style. Glorious sunshine, friendly locals, mouth-watering food and fascinating history – these are just some of the reasons why so many people fall in love with Spain and come back time and again. No matter where you choose to stay, you should definitely venture out in your rental car to experience more of spectacular Spain. Even better – why not set off on an epic road trip to explore cities near and far? Make your way to the capital, Madrid, to feast your eyes on masterpieces by the Spanish greats, including Goya, Dali and Picasso. The Prado, the Reina Sofia Museum and Thyssen-Bornemisza Museum form what’s known locally as the ‘Golden Triangle’. Peruse this treasure-filled trio of globally renowned galleries if you want to feed your inner culture vulture and explore European art. Dipping into the three will see you span centuries, from the Renaissance to Modernism, Cubism and all points in between. Picasso’s masterpiece, Guernica, at the Reina Sofia Museum is a real highlight. As perplexing as it is beguiling, be sure to stop and study the surrealist genius’ highly political monochrome marvel. Follow the inimitable architectural footprint of Antoni Gaudí as you wind your way around Barcelona. The hypnotic wave-like fascia, of Casa Milà, punctuated by twisting, wrought iron balconies, earned its place as a UNESCO heritage site in 1984. It’s just a short walk from Casa Batllo, which evokes dragons, and not far from the legendary unfinished cathedral Sagrada Familia. Lovers of modern art are well-catered for at the Guggenheim in Bilbao. Designed by the renowned Frank Gehry, the exterior of the museum is a vision of sweeping, silvery curves. Indoors, striking examples of contemporary art fight for your attention. Expect everything from atmospheric photography to intricate sculptures and emotive illustrations. Duck down side streets in towns and cities, and a whole world of classic and modern Spanish food awaits you. When it comes to delicious Spanish food, there’s no tapas like authentic tapas. Get your fingers messy with juicy, garlic prawns dusted with chilli (gambas al ajill) and fill up on fried potatoes in a smoky tomato sauce (patatas bravas). From region to region you’ll find varieties of ‘jamon’ to die for, while the pinxto bars of San Sebastian are internationally renowned. On the southern coast, you can sample the freshest seafood. Treat your taste buds to paella, seasoned with saffron and a mix of succulent meat and fish – this filling dish will take you from starving to satisfied to siesta in no time at all. This sun-drenched archipelago is home to three of the most popular islands in Spain. For a glimpse of the country’s unique history, discover megalithic structures and medieval coastal walks in Menorca. Laze on endless, soft beaches in Majorca and choose between the hedonistic Ibiza experience or a tranquil one on quieter stretches of the island. 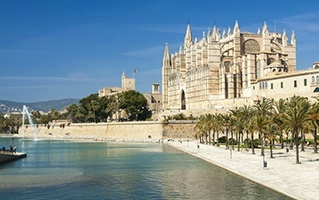 Hop in your rental car and take a connecting ferry from Denia, and in around 3 hours you’ll reach the turquoise-tinted waters of these islands. Each one has its own personality and plenty of sights worth seeking out away from the beach. The lesser known isle of Formentera can be reached via Ibiza, and has crystalline waters, quieter beaches and some of the best snorkelling in Spain. All four islands have good road networks, making them excellent locations in Spain to explore in your rental car. Having a hire car in Spain is like having the key to a chest overflowing with treasure. Venture far and wide to see all this beguiling country has to offer. With a comprehensive network of highways and secondary roads, Spain is both easy and pleasurable to navigate by car, with routes both scenic and straightforward. 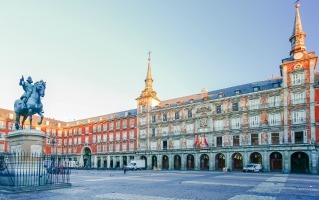 The capital, Madrid, sits at the very heart of the country, and has many connections for onward travel plus a series of nearby day trips you can take, such as to Salamanca or Toledo. The former boasts a gorgeous grand square, Plaza Mayor, while the latter has magnificent buildings that tell a tale of religious variety. To reach the beaches and sunny resorts of the south coast, you can use the E-901 or AP-36 from Madrid to get to Alicante, Torrevieja and Los Alcazares. You can also use the E-901 to access the eastern port city of Valencia, with its relaxing beaches, immersive space-age museums and nearby Albufera Park - a pristine nature reserve with walking trails. 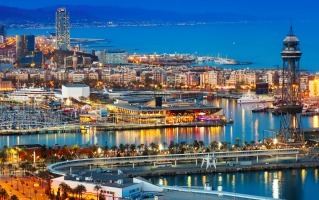 Many visitors head northeast to Barcelona, with its unique Catalan Modernism architectural style, collection of great urban beaches and stunning and inventive food scene. You can reach Barcelona in about 6 hours from Madrid by taking the E-90 via Zaragoza. 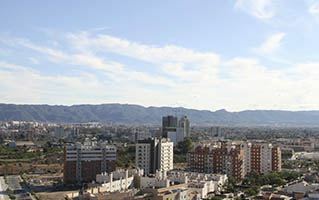 The E-15 runs down a vast swathe of the south coast, connecting Barcelona with all the popular beach resorts and cities like Villarreal and Valencia, with connecting roads running further south to Cartagena and Malaga. There’s also a matrix of main roads in the north connecting Pamplona, Bilbao and San Sebastian, including the AP-68, A-12 and the A-15. In Spain, you drive on the right side of the road like the rest of mainland Europe. In built-up areas, the speed limit is 50km/h. On 2nd category roads and 1st category roads, the speed limits are 90km/h and 100km/h respectively. On highways, you can go up to 120km/h, while keeping a minimum speed of 60km/h. Spain has a collection of toll roads, which you can find a complete breakdown of online. There are often alternative, free roads to take, but it may extend your journey time.